This book is one out of 8 IAEG XII Congress volumes, and deals with the theme of applied geology, which is a critical theme for the global economy. In the international, multidisciplinary approach to major engineering projects (either to macro- or mega-scale), the application of geological investigation techniques is fundamental for properly selecting the location sites, planning the construction and maintaining the infrastructures. The contributions in this book include not only engineering constructions but also case studies related to large projects on geo-resources exploration and extraction (minerals, petroleum and groundwater), energy production (hydropower, geothermal, nuclear and others), transportation (railway and highway) and waste disposal as well as the environmental management of these and other activities. 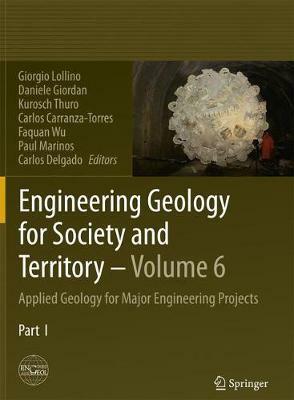 The Engineering Geology for Society and Territory volumes of the IAEG XII Congress held in Torino from September 15-19, 2014, analyze the dynamic role of engineering geology in our changing world and build on the four main themes of the congress: Environment, processes, issues, and approaches. The congress topics and subject areas of the 8 IAEG XII Congress volumes are: 1. Climate Change and Engineering Geology 2. Landslide Processes 3. River Basins, Reservoir Sedimentation and Water Resources 4. Marine and Coastal Processes 5. Urban Geology, Sustainable Planning and Landscape Exploitation 6. Applied Geology for Major Engineering Projects 7. Education, Professional Ethics and Public Recognition of Engineering Geology 8. Preservation of Cultural Heritage.